A very creative movie that goes in totally unexpected directions and ends up being a lot of fun. This is another cool Pixar movie. That’s no surprise considering all of their movies tend to be pretty good in one way or another, but this movie strives on being different. It starts out with the usual routine storyline about a young girl who is being forced to choose a suitor by her parents. The girl rebels, of course, and wants to be free. Only the movie changes over at that point to something totally different. It no longer becomes about this girl’s romantic troubles, but instead, about her on a magical adventure. the conflict of the film is totally unpredictable, as are the events that happen to her once she leaves her kingdom. The setup might be the same kind of thing we have seen before, again and again, but boy does this movie go to new and fun places after that. Brave is not what you would expect. That’s pretty funny, considering how much the trailers make it look like the same old clichéd movie that we’ve seen a thousand times before. It seems like it’s about a girl who is being forced to get married by her parents, only she doesn’t want to. She wants her own freedom and ability to choose. That might be the initial premise of the film, but boy does it go in other directions after that. It’s all the usual sort of thing, and I am very impressed with the ways that brave accepts the regular setup, but then steers clear of that predictable path. The girl, Merida (Kelly MacDonald), does get put in this position by her parents, and she does run away from home, but at that point, the movie starts to do it’s own thing. Instead of meeting a village of poor people and disguising herself as one of them, Merida comes to a witch in a cottage and gets a spell. She then returns home to use the spell on her family. Whereas all those other films wouldn’t have her go back home until the end of the movie, to complete the circle and the heroes journey of the return, this movie brings her back right in the middle of the movie. It’s just one more way that the film is trying to avoid the usual path. From there, the movie becomes about magic and a curse, and a whole new sort of adventure. I like the way the movie doesn’t go for the name actors, but instead goes for the actors who will be best for the roles. Billy Connolly is a very brave choice (no pun intended), especially to play a big, hulking brute of a character. I was expecting Gerard butler to be the voice of this father. When he wasn’t, I was expecting butler or someone just like him to appear, as the love interest that it seemed like Merida would certainly find before the end of the film. Once again, this movie proved me wrong. This movie is so unique from other animated films, that it doesn’t even include a real villain. Consider the first four Disney animated films. The Little Mermaid, Beauty and the Beast, Aladdin, and The Lion King. There had a to be a villain in he or she had to be larger than life. The same goes for the first cg animated films like Toy Story (with Sid, the kid next door, as the bad guy), Shrek, and Monster’s Inc. but in brave, things are really turned on their head, and the villain becomes the curse itself, instead of the woman who put the curse on the family. Similarly, the conflict isn’t between a hero and his or her enemy, but between two family members. It is between Merida and her mother, two characters who both have a lot of pride and see the world through very different points of view. The two of them end up going on adventure together in the second half, and while all of that is happening out in the wilderness, the father, Fergus (Connolly), is forced to hold down the fort and entertain all the guests at home. Only even that scene isn’t what you would expect. Instead of the father trying to perform jokes or musical numbers, just for laughs, what ends up happening is a giant fight breaks out between the different kingdoms, and chaos ensues. While I admire this movie for all of the ways it sidesteps clichés, it also feels at time like a little too much is missing. I am very happy that the movie wasn’t about love and about meeting a new guy and brining him home, but I could have used some kind of a villain. Even up, which was about the relationship between an old man and a boy scout, featured a villain by the end of the film. The same can be said of Wall-E, with the hall-like computer taking command. 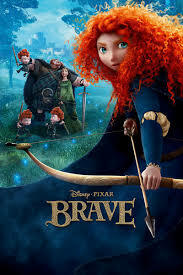 But here, in brave, the villain is simply the conflict between mother and daughter. It’s a little too poetic, and not enough real substance. The movie is certainly good though, and deserves lots of points for its creativity. I also did enjoy the first half of the film, which played on the usual clichés. The boys that were presented to Merida by different kingdoms, as potential suitors to be her husband, for example, weren’t the usual hulking dumb dumbs that most movies would give us. Instead, they were all just arrogant weaklings. That’s because our heroine had to be more athletic and skilled with a bow and arrow than any of them. 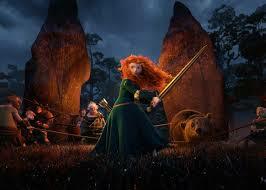 The movie does a nice job of combining adventure with comic relief, including Merida’s three mischievous brothers. It’s an enjoyable film, and like most of the recent Pixar movies (Up, Ratatouille, Wall-E), this one strives on its ability to be unique.